Performers include: Steve Harvey (host) and Burton Richardson (announcer). The classic game show, Family Feud, returns to primetime as a regular series. Celebrity families and friends compete against one another to benefit their favorite charities. The first family to reach 300 points wins the game and goes on to the Final Round. During the final round, one member of the winning team must quickly guess top answers to five survey questions. Then, another member must do the same, without duplicating their teammate’s answers. To win the grand prize of $25,000, they must reach 200 points. What do you think? 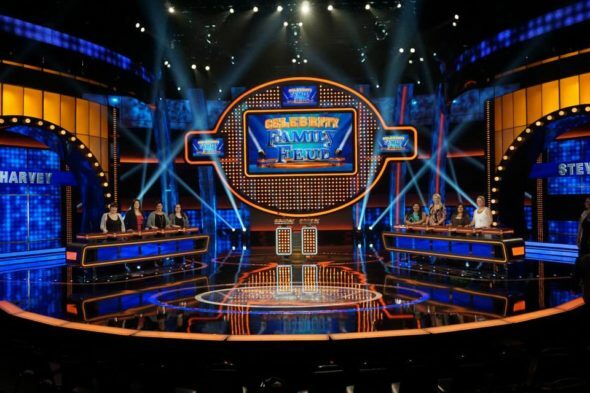 Do you like the Celebrity Family Feud TV show? Do you think it should be cancelled or renewed for another season? You’re not gonna believe this but the cast of The Bold and the Beautiful just took part on All Star Family Feud in Australia. If you don’t believe me, check it out. Sorry, I meant to write this. What a awesome celebrity game show Celebrity Family Feud is. Are there any plans for some new celebrity game shows? Such as Celebrity Wheel of Fortune? Celebrity Jeopardy? and Celebrity Who Wants to Be a Millionaire?